Secret Agent K-7 is an agent with American Intelligence. Now, who he really is remains largely unknown and that most definitely fits into the mold of a "secret agent". He is an agent and his identity is a secret. There is a fair chance that he is really Vincent "Lanny" Landers, a "special agent" who has traveled all over the country and the world fighting bad guys of one sort or another for many years. It could be a coincidence that two members of the government have mysterious jobs and have the same identification but I lean more towards K-7 being Landers than not. 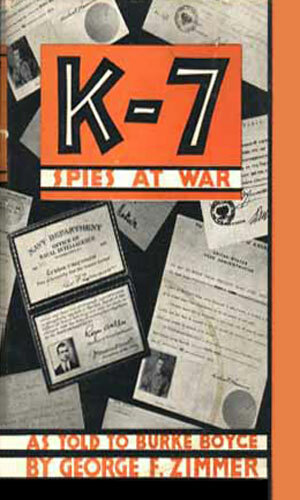 What we do know is that K-7 was for some time a world-traveling government agent, "America's number one adventurer, K-7, former United States secret agent who operated in 22 countries, on land, on sea, and in the air". This description comes from the radio program that related tales in which an older, now retired from the field, operative directed the actions of several other agents. This K-7 is decidedly the man of experience who knows the dangers to the American way of life from foreign forces who would rather see war than peace and who would use any provocation to cause conflict on all parts of the globe. As he tells the listening public, there are dark dangers awaiting everyone if dedicated people like his agents were not ever vigilant. Exactly how many people K-7 has working for him is never said but we do know from those radio broadcasts that he has at least three pair of operatives. Each of these pairs consist of a senior male agent and a more junior female assistant. The men are all similarly strong and serious. The women are each equally somber and dedicated and quite willing to head out on their own. While the real name of the men is never divulged, the identity of the women is readily stated. Also interesting is that while the women work in the same manner as the men and get put in danger just as often, they are not given codenames. Agent Z is teamed up with Patricia Norwood. Agent M has as his assistant Yvonne Durrell. Agent B-9 is aided by Rita Drake. There is also mentioned a time or two Agent L-6 but if he had an assistant, it is not said. As mentioned, when K-7 is dispatching these other agents to hot-spots needing attention, he is himself retired. There was a time, though, when he was not and several of those adventures in those "22 countries" are detailed in the pages of a comic book. In those missions he is aided by the same woman who would, likely later, work closely with Agent M, Yvonne Durrell. "Collection of sixteen true spy stories from the First World War as told by Zimmer to Burke Boyce." In the 30s and 40s the business of book tie-ins was in full swing. Leading this was Whitman Publishing, a company renown for its young adult line of books called the Big Little Books, big because they had a full-length story in them and little because they were considerably smaller in width and height than normal books, even the nascent paperback industry. 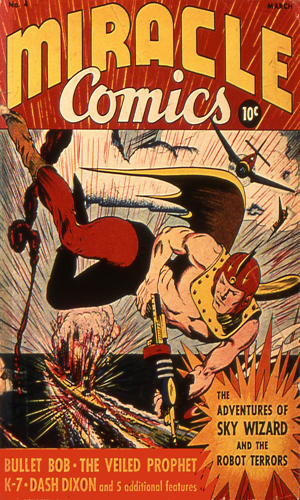 Whitman made a very good living licensing comic strip, movie and radio series and creating adventures in the BLB format. But Whitman was not the only one getting into this line of work. Saalfield Published was one of Whitman's main competitors and it, too, went into the miniaturized publishing act. They came up with the incredibly original name of Little Big Books for their line. Who would ever mix-up LBB for BLB, especially when the dimensions were similar as were the content. It was Saalfield that got the license for Secret Agent K-7. It approached Gene Stafford to pen the (what would be) only adventure. Stafford's books was "adapted from the radio scripts" which made sense since Stafford's main job was writing radio scripts for various programs, including that of K-7. "The stories in this book are told by a former member of the United States Secret Service, known as K-7. His adventures in the air as well as on land and sea in many countries are thrilling documents of the intrigue and espionage that exists today among the nations of the world. Modesty compels the hero to disguise himself under another name, K-7; but only the principal actor in such gripping dramas could report them in such detail." Saving the Suez - Secret Agent Bill Malone teams up with an old assistant, Joan, as he works to find who is planning on blocking the Suez Canal and how. He quickly learns it is an old adversary, a spy names Ostov. Sealed Orders - Malone is working with Yvonne to find out who was behind the car accident that put a leading naval officer carrying vital secrets in the hospital. Enemies Within - Malone is asked by a high ranking cabinet member of a friendly nation to find out who is smuggling guns to arm rebels in his land. Yvonne is on hand to lend aid. Secret Airfields - Malone is working again with Yvonne to locate those who have been building secret airfields near the Panama Canal to make destroying it easier. The Code Book - The heartbroken love of a young officer convicted of stealing secrets and executed has offered her services to his spy boss. Malone has Yvonne go undercover as another woman with access to classified intel. Is Special Agent K-7, aka Lanny Landers, the man in the movie mentioned below, the man we would later hear on the radio identified as Secret Agent K-7? The "K-7" part matches, of course, but no one had a monopoly on the moniker. Comments in the one movie about him would indicate that he was abroad a lot doing secret sort of things (though he talked of mountain climbing) but no one specifically said he was either a spy or spy-hunter. 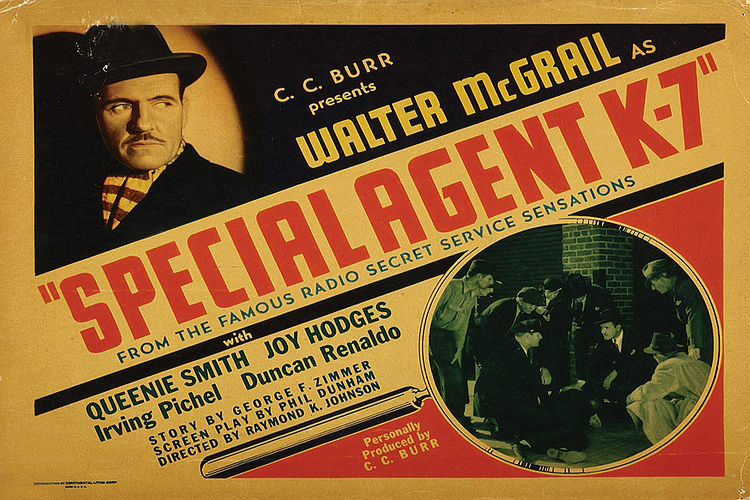 The movie poster does point to the connection because it clearly states it is "from the famous radio secret service sensations" and as mentioned in the Radio section, NBC Radio had a Secret Service Spy Stories in 1932-33. The plot and some of the dialogue would indicate that K-7 was fighting crime rather than spies but there is no getting around the tag line in the poster nor the mentions of overseas operations. Most telling, though, is the fact that George Zimmer, the man who is credited for creating the radio program, was, according to IMDB, the man who created the character. Add to that the fact that two before the movie came out, a book of "true spy stories" as told to Burke Boyce by George Zimmer was released. So Zimmer either was a spy during WWI or knew them enough to learn a lot of their stories. He created a radio program using that knowledge and using the fictitious Secret Agent K-7 as the character. He then told some of these stories for the book. The question is whether he meant Lanny Landers, Special Agent K-7, to be the same man as the radio spy OR just really liked the codename. Special Agent K-7 is pulled into the investigation of a murder at a swanky nightclub run by a notorious gangster. According to the terrific website Digital Deli, in 1932, NBC Radio presented a radio program called "K-7". How many episodes were aired is unknown - well, virtually anything else is unknown and no copies of the show nor any scripts are available. Spy Television expert Wesley Britton has made mention of NBC Radio's Secret Service Spy Stories which ran from 1932-1933. It is possible (my supposition) that the two were related but who knows! What is known is that in 1939, a new radio series presented a good number of 15-minute spy adventures named Secret Agent K-7 Returns. The exact number is somewhat suspect - I have seen it listed as 78 and 79. If it were that many, there are a dozen which have vanished or there were a dozen repeated. Several excellent websites dealing with Old-Time-Radio broadcasts have catalogued the "known" episodes. These lists have some differences caused probably by the fact that there is no clear record. Exactly which episode was aired when is debatable. One thing that I feel is not really debatable (and therefore likely to be argued) is that the episodes fell into two basic groups. Each group would have a tale recounted of the work of one of K-7's agents. Each episode started with a Morse code radio signal followed by the announcer telling the listeners the name of the show. The void would then let the audience know that "America's number one adventurer, K-7, former United States secret agent who operated in 22 countries, on land, on sea, and in the air, brings you another story of today. Here is K-7 ..."
In the first group, numbering around 31, at this point a very somber sounding individual, speaking slowly and methodically and in a voice that clearly showed the speaker was not a young man, gave a brief description of the sort of trouble that the night's adventure would concern. This man was K-7 and his manner showed how dire things were getting and how lucky the country was that men and women like those under his command stood up to fight those who would hurt the nation. In these earlier episodes he would then pass the mic to "my old friend" John Holbrook who would finish setting the scene for the adventure to be told. Mr. Holbrook would talk of these cases as those of fellow agents of K-7. In the second group, running from around #32 to the end of the series, would take a different style. In these later stories, the story would start with K-7 in a secret office communicating either in person or by phone or radio to one of his agents what the assignment was. K-7 did not actively take part in these cases but he would be called on occasion with updates and would supply instructions or dispatch help. The audience would hear him buzz on the intercom, be answered by a female voice, and then order an agent into his office "for orders". The agent could be heard "reporting for duty" and then K-7 would set the mission dynamics and send the agent on his way with the concluding directive to "keep me informed". During these missions, K-7 apparently traveled around the world because he would often tell which ever agent he summoned that "we are in this country" and that country might be in Europe or the Far East or just at an unspecified location. It is interesting that when K-7 pushes the intercom to talk to his assistant, he always announces that "this is Secret Agent K-7 speaking ...". (Who else would it be? Wouldn't the assistant, the same female voice each time, likely recognize her boss's voice after so many such buzzings?) However, he always refers to the man he wants sent in for assignment as "Special Agent". Another thing I spotted was the fact that each of the three main Special Agents (M, Z, and B-9) call their female assistant by her first name but never do we hear the women call the agent anything but his codename. Do they know it? That seems odd. Oh, well. The episodes listed below are the ones that I found on these excellent OTR sites I mentioned. Again, the numbering system is suspect so the order I present them in, and the number I have assigned, is currently my own and is BY NO MEANS authoritative. The year is just what I am guessing based on these sites. The titles I have given them ARE the titles I have seen most often used by these sites, though. The plots are my take from having listened to them. Agent Z and Patricia take on a gang who are conducting border violations to cause the nations affected to start rearming for their protection. The gang was making a fortune selling the arms to those countries. Z had apparently had Pat's help in a previous matter and asks her if she would help "again". She readily agrees. Agent B-9 and Rita are put on the trail of Zora LaValle, another "Mata Hari" spy who is obtaining the formula for a horrific poison gas weapon. Also tells how Rita became B-9's assistant. Agent M and Yvonne work together, for apparently the second time, to uncover a man who is high enough in the government of one nation to get vital intelligence which he is selling to other nations. Agent Z and Patricia break up a gang smuggling cocaine into the country. Agent B-9 and Rita are asked by the head of a airplane parts manufacturer to find the saboteur who is causing havoc at his plant. Agent Z and Patricia go after master spy George Shostak who is planning on destroying a section of fortified border with a neighboring country. Agent M and Yvonne use handwriting analysis to figure out who an assassin was and then to help break up the "Blood and Steel Society." Agent Z and Patricia are in a country where a group is illegally using the radio to foment dissent among the citizens - and it is working very well. Z and Pat are determined to stop them. Agent M and Yvonne are in a possibly Mid-East country to find out more of a young woman who is sneaking coastal defense secrets across the border. Agent Z and Patrica investigate a ship recently sunk just off port. Z suspects that the ship had in fact been carrying illegal munitions. Agent Z and Patricia have the difficult task of stoping saboteur Sturm Walters from destroying a train carrying munitions to strengthen a country's defenses. Agent Z, M, and B-9 are used in the telling of a hypothetical story by an "old statesman" and friend of K-7 about how spies can use disinformation to bring about revolution and loss of freedom. Agent M and Yvonne are tasked with learning how word of a new aerial bomb leaked out. Agent B-9 and Rita take on a master spy who is also involved in smuggling "undesirables" into a country. Agent M and Yvonne check out the sabotage of a new high speed bomber. Agent B-9 and Rita take on a master spy who is sneaking into a country using the help of an old customs inspector. Agent Z and Patricia have the difficult task of safeguarding a large shipment of gold being moved by one country, in fear of attack by an unfriendly one, to a friendly one. Agent B-9 and Rita are looking for some enemy agents sneaking into a friendly country onboard the liner "Storm Cloud". Agent M and Yvonne are facing tough odds in trying to prevent a civil war in another nation. Agent Z and Patricia Norwood must get their hands on stolen air defense plans before the plans are smuggled to an unfriendly nation. Agent B-9 and Rita are after a famous spy named Lotta Rowan who is in turn after the plans for a newly developed thermite bomb, using blackmail as her main weapon. Agent M and Yvonne must learn how a master spy working for a "pirate nation" has gotten his hands on the movement plans of a friendly nation's fleet. Agent Z and Patricia have been asked to learn who is behind a series of attacks on warehouses containing vital food supplies of a friendly nation stocking up in case of war. Agent M and Yvonne go after the gunmen from the secret police of an unfriendly nation who have killed two dissidents walking in a park planning to start a newspaper to spread the truth back home. Agent Z and Patricia are in a foreign country to learn what happened to an emissary in Asia who was attacked while on a train returning with the plans for a new plane and a large order for several of the aircraft to be built. Agent B-9 and Rita must stop a master spy who is smugging information to his operative using innocent travellers who carry these orders without ever knowing. Agent Z and Patricia are up against saboteurs who have already destroyed one shipment of new bombers, transported in the hold of a liner, and who are after a second ship with similar cargo. Agent M and Yvonne are up against the spy Antiv Vladev, said by M to be one of the world's cleverest spies, who is using diplomatic passports to smuggle out information. Agent B-9 and Rita are out after a spy who has used a plane to fly over one nation's shipyards and used infrared film to gain valuable intelligence and now wants to sneak it out of the country. Agent Z and Patricia are asked by a friendly nation to look into who is causing dissent in one of its valuable colonies, raising fear of rebellion and the loss of valuable resources. Agent M and Yvonne have been asked by the ambassador of a friendly nation to go into a neighboring land to see if its people are as anxious for war as its leaders. Agent M and Yvonne are in a country's capital and are tasked by K-7 to find the group of spies who have been arming its followers in preparation for a coup. Agent Z and Patricia Norwood go onboard an incoming refugee ship to find a spy named René Braun who has taken another man's identity to sneak into the country. Agent B-9 and Rita tasked with finding the person issuing fraudulent passports and selling them to enemy spies. Agent Z and Patricia are in a country to find out who is behind the plot to turn many of the cabinet to favor an alliance with a unfriendly neighbor. The plan includes killing the Premier who opposes the alliance. Agent M and Yvonne look into the case of Aviation Lieutenant Yardland who has been accused of stealing some secret plans. Agent B-9 and Rita Drake are told to find a stolen Navy code book and has only 24 hours to do so. Agent Z and Patricia Norwood are assigned to catch spy named Carl Frakenburg, a man who is sneaking information across borders without being caught. Agent M and Yvonne are in The Hague to locate an old inventor of a machine gun who has gone missing. Agent B-9 and Rita are sent to find and apprehend Dimitri Poulos, a despicable man who makes a business out of "wholesale murder" by pretending to smuggle refugees into a different country but then abandoning them on a deserted island. Agent M and Yvonne are in a country to find and stop a foreign spy, Anton Rane, from sabotaging the testing of a new anti-aircraft gun. Agent Z failed to keep an appointment with K-7. Patricia is told to link up with Agent L-6 and investigate what happened to Z. Agent B-9 and Rita head to a friendly nation to find out who is flooding that country with counterfeit money. Agent B-9 and Rita are assigned to Major Alpha, a scientist who has created a new vapor gas formula for defense purposes. A spy wanting the plan has decided to kidnap B-9 and take his place. Agent M given the job of finding who is behind the sabotage an aircraft factory even as two of the latest model are about to be tested. Causing trouble is the fact that his assistant Yvonne is missing. Agent Z and Patricia are to find out who is offering the defense plans of a friendly nation. Agent B-9 and Rita are sent to save a European nation from falling. A secret ultimatum by a hostile neighbor is being sent demanding surrender. K-7 believes if they can uncover the ultimatum and give it to the press, the matter will go away. Agent M and Yvonne is in a city which had once belonged to one nation but which had been given to another nation after WWI. The first country wants it back and thus the city is now a "hot bed of intrigue". André Zermin is a spy that is up to no good in that city. Agent Z and Patricia are in the Far East to locate a spy who is really the man responsible for a crime for which a man named Major Hurrell has been charged and for which he could face the firing squad. Agent M and Yvonne are put onto hunting a drug smuggling ring that may be doing more than just bringing in illegal substances. Agent B-9 and Rita are told by K-7 that there is evidence someone is getting an illegal look at plans for a new plane at an airplane factory and they are to find out who the sneak is. Agent Z and Patricia are to carry some "state papers" to another country, a dangerous assignment because two other agents have already lost their lives doing so, killed at the hand of a spy named Lederber. Agent M and Yvonne are to find out who is behind a string of murders of high ranking officials made to look like suicide, all with the end result of overthrowing the government. Agent Z is ordered by K-7 to look into the disappearance of Patricia Norwood who left a note asking Z to meet her at "Royal House" the night before and then vanished. Agent B-9 and Rita are assigned to a Colonel Crannock at "the fortress" to learn how military secrets from that facility are being stolen. Agent M and Yvonne are sent to a naval base where a notorious freelance spy, Manual Goenhaul, was suspected of being, having snuck in from the Orient. Agent Z - An agent for the aggressor nation in the Far East, though named "Franz Robita" is heading to this country for reasons unknown. Agent Z is sent to find out what he is up to. B-9 and Rita are tasked by K-7 to help travel to a country in the Orient to help a man named Wong find out who the traitor in Wong's organization is. Agent M and Yvonne are assigned to capture a spy that in known to be operating in Paris but who has eluded several agents already. B-9 is told to work with L-6 (Rita was assigned to other duties by K-7) in watching a letter box drop site and finding who is using it. Agent Z and Patricia are sent to look into the disappearance of some important documents from the desk of a colonel who is an old friend of K-7. Agent M and Yvonne are assigned to locate a beautiful blonde girl named Ona Lajos who have just crossed the border into an unfriendly nation carrying documents that they must get back. Agent Z and Patricia are in a friendly European nation where some government officials are working with a foreign power to slow defense programs. Their orders are to investigate and find who are the accomplices. Agent M and Yvonne are sent to find and arrest Marie Bimieux, a famous and dangerous French spy during WWI, who is active again and has documents that must be recovered. Agent B-9 and Yvonne Durrell are in Switzerland to find out who stole a secret map. Agent Z and Patricia must accompany a high ranking official on a secret mission to the East. Their job is to make sure the man arrives safely. 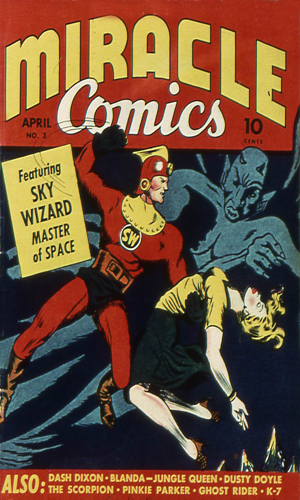 Hillman Periodicals was an American publisher of magazine and comic books started by Alex Hillman in 1938. While it was never a big name in the comic industry, it did manage to last until 1953, no small feat. Hillman did not have, from what I could find, a large portfolio of titles. They tried for an assortment of genres with romance, western, and airplane stories leading the list. Two concerned superheroes. One of those was Miracle Comics which lasted but 4 issues, and it was in this comic that the K-7 stories appeared. As was common in the early comicbook days, Miracle Comics was an anthology. Sky Wizard, Master of Space was the lead. 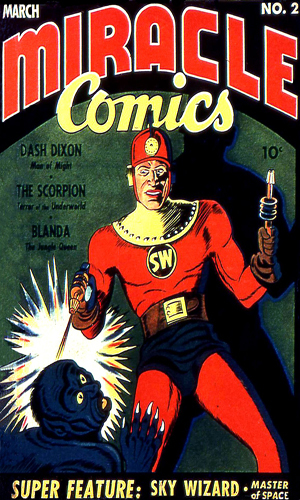 He would last all 4 issues along with Secret Agent K-7, Dash Dixon, Man of Might, The Scorpion, Terror of the Underworld. Blanda, the Jungle Queen survived for three issues. Pinky Parker, the Kid Cop and Dusty Doyle, the Circus Cyclone would appear in two issues. Other one-shots graced each issue. 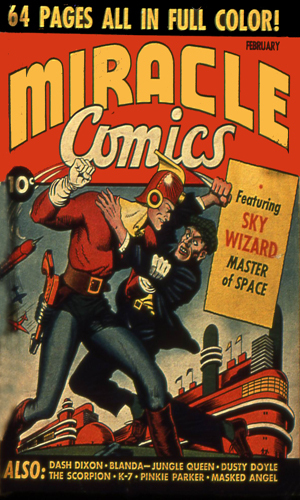 Unlike many of the spy comic series of the time, and anthology series in general, the length of those in Miracle Comics were of a decent length to tell a better story. Secret Agent K-7 had each tale lasting 8 pages. This gave a bit of time for the plot set-up, a good deal of action and suspense, and then a decent, believable (well, allowing for comic book 'reality') conclusion. The experienced comicbook writer, Emile C. Schurmacher, was the man who penned all 4 of the tales. It was reported that he was also the artist but comments on the excellent Comic Book Plus website details how the man himself stated otherwise, saying he was a writer, not an artist. So who did the artwork is unknown. 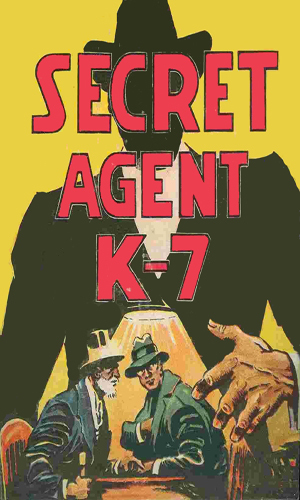 As mentioned in the Radio section, Secret Agent K-7 was, for all the adventures in the Secret Agent K-7 Returns group, the head of the organization who assigned missions to his agents. He was no longer in the field. In the four comic adventures, however, it is K-7 himself taking part in the action. He had as his assistant the quite resourceful and helpful woman named Yvonne Durrell. The K-7 represented in these stories is a middle-aged man who is obviously still in good shape as shown by his occasional fighting and has good marksmanship. His assistant, Yvonne, is noteworthy for several reasons. One, in the radio adventures she is the assistant to Agent M, not K-7, though she was every bit as good with M as she was with K-7. Two, she is by no means a damsel in distress character always needing saving. She does get herself captured once but under circumstances that could easily have happened to her boss. From Miracle Comics #1 - Secret Agent K-7 knows that the man he dubs as "the most sinister figure in Europe" is up to no good but even he is surprised the man is out to kill two of his country's own diplomats in a neighboring nation to justify an attack. From Miracle Comics #2 - Enemy agents want the professor's new thermite bomb formula and kidnap the man to get it. Secret Agent K-7 and Yvonne are determined to get him back. From Miracle Comics #3 - When Secret Agent K-7 and his assistant, Yvonne, notice the presence of the man named Jaeger, nicknamed "The Death", a spy and a scientist, they connect him immediately for three deaths of South American diplomats. They decide to stop him from going on. From Miracle Comics #4 - Secret Agent K-7 and Yvonne have rushed to a Balkan city in response to that city's mayor's request for help. An invading force is planning to poison the water supply to get the citizens to surrender and he needs K-7's help. Wow, what a history. As mysterious as the man himself. Since I have never listened to or read any of the scripts from the first K-7 series, I can say nothing about its quality but of the Return I can say a fair amount. The preambles to each tale are, well, different. Two different styles - one lecturing and the other administrative. I really have no preference as the lectures were interesting while hearing him act as spymaster made it feel like the agents (M, Z, and B-9 as well as their assistants) were part of an organization rather than freelancers. The tales themselver were quite entertaining and I appreciate the fact that so many sites have made the tales available for listening. The writing was of good quality and the presentation was darn good - ten minutes each of fine story-telling. The comics were good stories as well though at odds with the radio broadcasts. The book was more in keeping with the shows but that just made sense since the former's author was one of the latter's writers (if not the only one).